Heat 1 tbl butter in an oven-proof pan over medium heat and add the chopped onions. Cook until translucent, about 4 to 5 minutes. Add kale and stir until it becomes bright green. Cover and allow to cook until tender, about 7 to 10 minutes, stirring occasionally. Meanwhile, beat the eggs and milk together in a separate bowl. Add the cheese and salt and pepper. When the kale is thoroughly cooked, add 1 tbl of butter to pan and coat the bottom, then add the egg mixture to the pan and spread the vegetables evenly throughout. Allow to cook for about 5 minutes or until the sides are just about set. Sprinkle the top with a bit more Parmigiana Reggiano as well as a bit more salt and pepper. Place the pan in the oven and cook until the frittata is firm, about 10 to 15 minutes. Check with a knife to see that it is cooked all the way through. 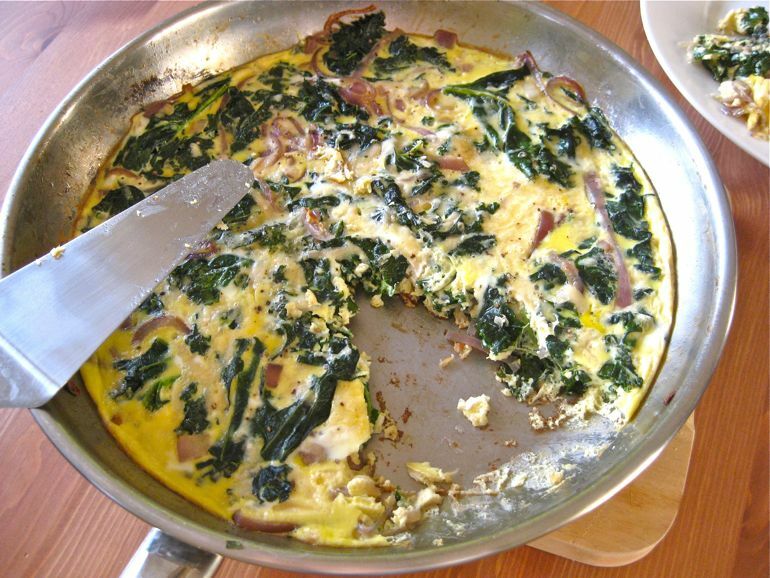 I love frittatas because they are easy to make and can have so many variations. You can substitute any vegetables here, asparagus (get it while it's still in season!) is a great addition to a frittata as are mushrooms, broccoli, potatoes, garlic, shallots ... and on and on. This is a great last-minute dinner that can be ready in less than a half-an-hour. Eggs are packed full of nutrients, healthy fats and protein. They are pretty darn close to a perfect food. The best option is to eat pastured eggs — meaning eggs that come from chickens that are raised on open pasture and regularly eat grass, plants, bugs, grubs and whatever else they can find in the fields. Chickens are omnivores and the quality, taste, and health benefits of their eggs is largely dependent on what they eat. Kale is a member of the cabbage family and as such, exhibits the same kind of anticancer properties as all the other members of this family. Kale is actually one of the most nutritious vegetables, with high amounts of carotenes, vitamins C and B6, and manganese. It is a great source of calcium, iron, and copper as well as dietary fiber, B vitamins and vitamin E. As you can see from its deep green color, kale is very high in chlorophyll. The deeper green your vegetable, the more health benefits it contains and kale is one of the darkest! Onions contain sulfur compounds like allicin which have strong effects on boosting immunity. They also contain one of the highest amounts of quercetin of any food — a flavonoid which helps to calm allergies, reduces inflammation, and is a powerful antioxidant providing protection against cancers and heart disease. Clinical studies have shown that onions lower blood pressure and prevent clot formation as well.